Happy New Year Scooter Swaggers! Well darn. This post was scheduled to appear on New Year’s Eve but didn’t. Ah well . . . here are some perpetual calendars you won’t have to replace year after year. With month and day wheels, just spin for the date. Available at Scooterworks – type “calendar” in the search engine to see all the choices. 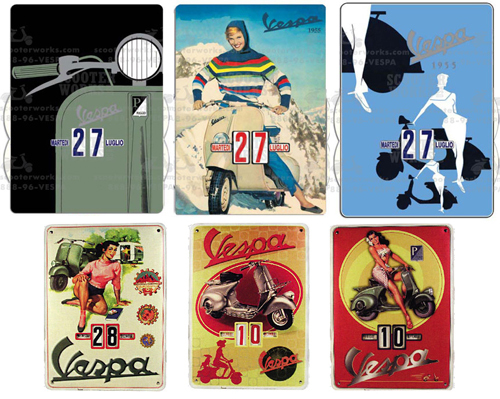 This entry was posted in Decor, Miscellaneous, Stationery and tagged perpetual calendar, scooters, vespa, Vintage Advertising by Tracy. Bookmark the permalink.